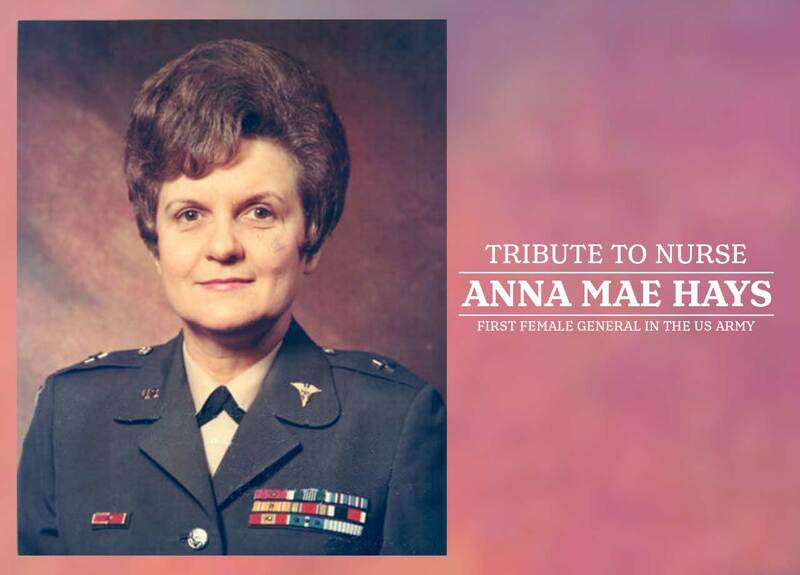 Anna Mae Hays, who passed away on January 7, 2018, started her career in the US Army as a frontline nurse in World War II and retired in 1971 as the Chief of the Army Nursing Corps (ANC) and the first female general in the US Army. Hays was a forward-looking leader who steered the ANC through an era of rapid modernization and used her influence to improve service conditions for all women in the armed forces. Hays was born to Daniel and Mattie McCabe on February 16, 1920, in Buffalo, New York. Both her parents served in the Salvation Army and the values of service and religion, as well as music, featured strongly in the family. 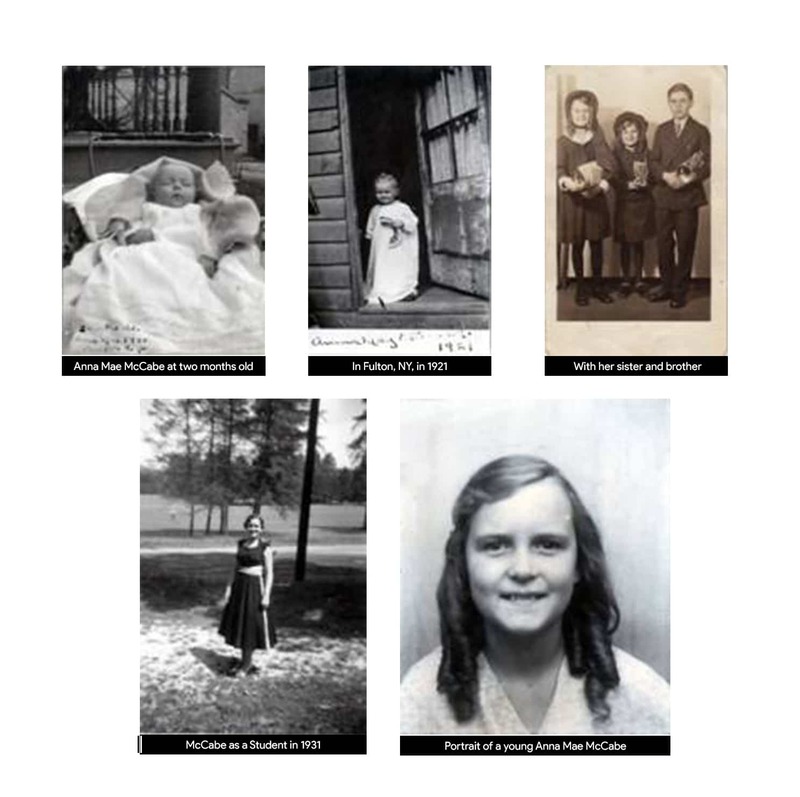 She played the piano, the organ, and the French horn and would have liked to study music after completing high school in Allentown, Pennsylvania. As funds were not available, she decided to pursue nursing instead, a field that she had also been interested in from a young age. Hays enrolled at the Allentown General Hospital School of Nursing in 1939 and, in 1941, she was the first student at the school to obtain her Diploma in Nursing with Honors. The year 1941 was also the year in which the US entered the World War II, and joining thousands of other young men and woman in service of the country, Hays signed up with the Army in May 1942. In January 1943, Hays joined the war effort, and instead of being posted to Europe as anticipated, she found herself in India serving with the 20th Field Hospital at the entrance to the Ledo Road which cut through the jungle to Burma. The conditions at the hospital were extremely primitive. All the hospital buildings, except for the operating room, laboratory and X-ray building, were bamboo structures with mud floors and leaf fronds for roofs. “Of course, the heavy rains would pour seven-eight inches of water in 24 hours during the monsoon season. You can imagine the mud problems,” recalled Hays. “Doors were weaved bamboo with no closures. It was quite an experience when a sacred cow or a jackal would run through a ward or the nurses’ quarters.” At one time, while being treated in hospital, Hays even caught sight of a cobra under her bed and casually asked a guard to shoot it. The majority of patients who were admitted to the hospital were suffering from exotic diseases – in particular, malaria and typhus – and this was in the days before antibiotics. Even most of the hospital staff came down with dysentery, dengue fever or malaria. There was, however, also some respite from the hard work. Hays recalled that there was a British club about two miles from the hospital where they would go dancing once a week. Pilots from all over would travel as far as 50 miles through the jungle to visit with the girls for a few hours. After the war, Hays chose to remain in the Army Nursing Corps and served in various hospitals until she became one of the first nurses to be deployed to serve in the Korean War in 1950. According to Hays, the conditions at the 4th Field Hospital in Inchon were worse in many respects than in India. 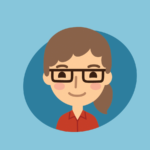 In fourteen months, she and 31 other nurses cared for more than 25,000 patients, with as many as 700 patients admitted in one night. At times they would spend hours on end in the operating room, getting as little as three hours sleep a night. Besides having insufficient supplies, “We had no water. It was so cold we wore whatever clothing we could. And because there was almost no firewood it was almost impossible to keep warm.” Hays however also acknowledged the many advances since World War II – antibiotics, whole blood, as well as rapid evacuation by helicopter. As she had also done in India, she spent some of her off-duty time playing a field pump organ for church services – including on the front lines. 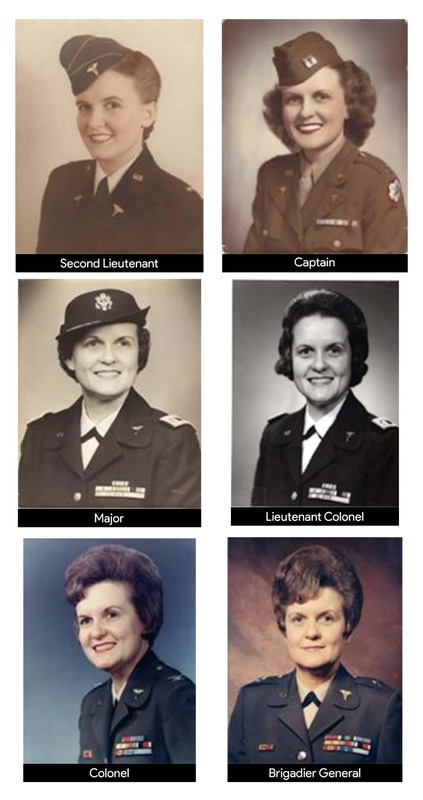 After serving in Korea, Hays occupied a number of positions as director, head nurse and later a chief nurse at various army hospitals and also did a course in Nursing Service Administration. 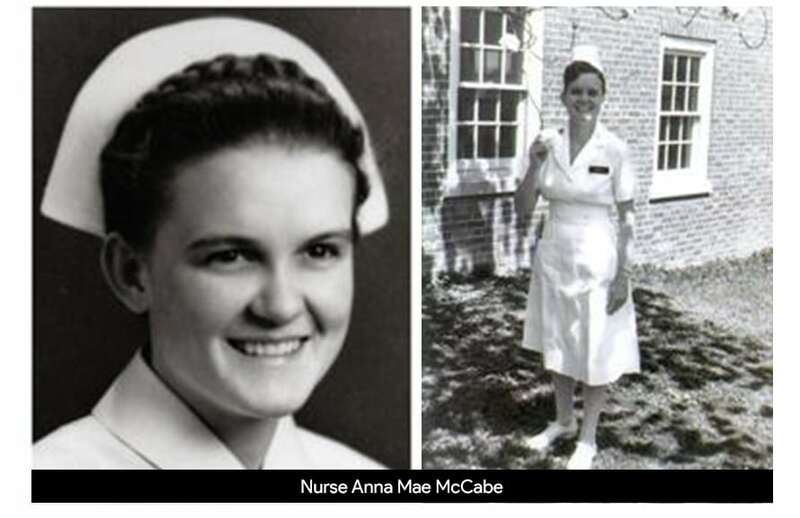 She completed a bachelor’s degree in nursing education in 1958 and a Master of Science in Nursing in 1968. In 1956, she met and married William A. Hays, who directed sheltered workshops and providing employment for the disabled. Sadly, her husband passed away only six years later. Hays was appointed as assistant chief of the ANC in 1963 and, soon after being promoted to the rank of Colonel in 1967, she became Chief of the Corps. This was the period of the US Army’s most active involvement in the Vietnam War and Hays led the ANC during one of the most stressful eras of US Military History. She traveled to Vietnam three times to monitor the situation on the ground for the 4,500 strong nursing corps stationed there. Hays was faced with many challenges created by the war. There was a shortage of nurses to serve in Vietnam, and she assigned over 30 army nurses to recruit duty. She gained approval to send more ANC nurses for graduate and doctoral education to civilian nursing schools – a move that served as an incentive for nurses to join the army. Various new training programs for nurses and paraprofessional personnel were also introduced. Hays was a leading force in achieving significant personnel policy change for women in the armed forces. These included for women not to be automatically discharged from service when they became pregnant; allowing women with younger children to be appointed to the Army Nurse Corps Reserve; and also granting husbands of female service members the same privileges enjoyed by the wives of male members. Hays was a leading force in achieving significant personnel policy change for women in the armed forces. Brig. 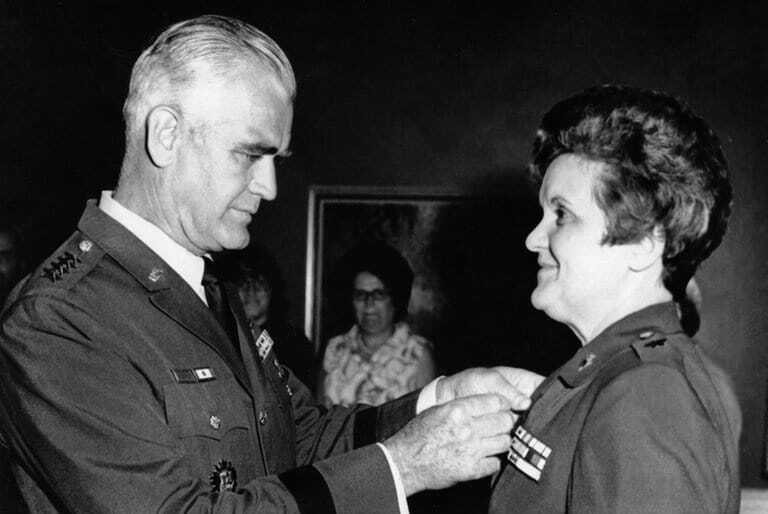 Gen. Anna Mae Hays receiving the Distinguished Service Medal from Gen. William C. Westmoreland in 1971. On retirement in 1971, Hays was awarded the Distinguished Service Medal during a Pentagon reception in her honor. “Well, I have to be very honest, one day being responsible to The Surgeon General for 21,000 men and women, […] and then the next day, not having any responsibility, is quite an adjustment to make” Hays commented during an interview. However, she did remain involved to some extent in the ANC and became active in professional affairs, issues in her hometown, and various retiree groups. In 2012 she was named one of the country’s outstanding citizens of the 20th Century a Lehigh County’s bicentennial in 2012. Hays passed away on January 7, 2018, from complications of a heart attack at the age of 97. Three days later, on the order of Pennsylvania governor Tom Wolf, the state flag at the Capitol Complex and all state facilities in Allentown was flown at half-staff in her honor.